There are some very ill memories for the Twins between 1993 and 2000. Kirby Puckett's glaucoma, the Chuck Knoblauch divorce, the franchise almost moving to Durham, and never winning more than 78 games in a season or finishing higher than fourth in the division all come to mind. There was, however, one bright star for the Twins during the ‘90s. A two-sport athlete at Jesuit High School of Tampa, alma mater to Lou Piniella and Jay Feely, Radke wasn’t highly coveted as a prospect. The right hander was drafted by the Twins in the eighth round (pick 206) of the 1991 amateur draft…a rather dry draft that featured Dmitri Young (fourth overall pick by St. Louis), Manny Ramirez (14th overall pick by Cleveland) and Shawn Green (16th overall pick by Toronto), but also featured stars like Nomar Garciaparra (fifth round, 130th overall by Milwaukee), Jason Schmidt (sixth round, 205th pick by Atlanta), Derek Lowe (eighth round, 214th pick by Seattle), Mike Sweeney (10th round pick by Kansas City), and Jason Isringhausen (44th round, 1157 the pick by Mets) picked in the later rounds. Radke made his debut on April 29, 1995 against the Baltimore Orioles in relief of LaTroy Hawkins. Radke would give up three earned runs on five hits in two innings in the eventual Twins loss. Hawkins lasted 1.2 innings, giving up seven runs on seven hits, and the Twins lost 13-7. Radke recorded his first win in his first career start on May 6 when he went 5.2 innings and gave up 2 runs on 6 hits, striking out Omar Vizquel and Jim Thome for his first career strikeouts. Radke finished 11-14 with a 5.32 ERA, 75 Ks and 47 BBs. He was voted to Baseball Digest’s 1995 All-Star Team and finished ninth in Rookie of the Year voting. Radke would have a better statistical year in 1996 with a 4.46 ERA and 148 strikeouts, although he did give up a career highs in walks (58 in 232.0 innings pitched) and homeruns (40). His penchant for giving up homers was so notorious that one 90's Sega video game claimed its action was “Real as Radke” and featured Radke watching homeruns sail out of the park. Who is the most dominant pitcher NOT named Johan Santana for the Twins in the last 40 years? 1997 was Radke’s breakout year, when he went 20-10 (winning nearly 30% of the Twins’ 68 wins), with a 3.87 ERA and a career-high 174 Ks in 240 innings. He also started a MLB-high 35 games. He finished in the top 25 in MVP voting and was third in the AL Cy Young voting behind Roger Clemens and Randy Johnson. He also won 12 consecutive games in 12 consecutive starts, only the third player since 1950 to accomplish the task. During the Twins' fire sale in the late '90s, the Twins dealt every player earning more than $1 million per year except Brad Radke, who was an All-Star in 1998, although Twins GM Terry Ryan has been quoted as saying that he "had some offers that were hard to say no to." Radke was put in a leadership role and became the face of the franchise after stars like Knoblauch and Scott Erickson were traded while veterans Kent Hrbek and Puckett retired. Radke put up steady numbers, despite the Twins' dreadful record of 404-548 from 1995-2000. But in 2001, a newly revamped Twins team was chalked full of young stars featuring outfielders Jacque Jones, Torii Hunter, and Bobby Kielty, first basemen Doug Mientkiewicz and David Ortiz, catcher A.J Pierzynski, and pitchers Eric Milton, J.C Romero, Joe Mays, and Johan Santana. All these players were 25 years old or younger. Radke became their leader, and helped lead them to a breakout season in 2001, posting the team’s first winning season in almost 10 years. In 2002, Radke led the Twins to their first AL Central title and their first division title since 1991. Radke had his best postseason series in 2002 against the heavily-favored Oakland A’s. Radke was 2-0 in the five-game series with a minuscule 1.51 ERA. The Twins would win the series 3-2, but would lose in the ALCS to the eventual World Champion Anaheim Angels in five games. 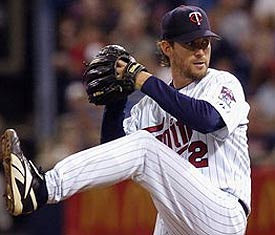 The Twins would win the division crown three more times (’03, ’04, and ’06) with Radke in the rotation. However, from 2005 to 2006, Radke suffered from a torn labrum, but continued to pitch. On Sept. 2, he suffered a stress fracture in his shoulder, which potentially ended his season. But, only 10 days later, he was throwing from 110 feet with no pain. He re-joined the rotation for the Twins down the stretch, replacing Francisco Liriano, due to his reoccurring elbow pain which would ultimately lead to off-season Tommy John surgery. During the month of September, however, Radke was in so much pain that he had to use his non-throwing arm to do simple everyday tasks, such as pouring milk or brushing his teeth. On Sept. 28, Radke pitched in his final regular season game, and his last game at the Metrodome, in which he got a no-decision in a 2-1 Twins victory over Kansas City. After the game, a usually-stoic Radke ended his career at the Metrodome tearing up in the clubhouse. After the Twins won the division, they were set to face Oakland in the ALDS, the team Radke had success against in the ’02 playoffs. But in his one start, he gave up 4 runs (two 2-run homeruns) on 4 hits in 4 innings. Brad Radke was a free agent again after the 2006 season, and could have earned millions in the exploding free agent market, but after 12 years, Radke decided he had had enough and retired from baseball. Radke had pitched with a torn labrum for the last two years and a stress fracture in the joint added to the pain. Surgery would have been required to continue, and he wasn't interested in a lengthy rehabilitation. Radke finished his career as one of the most consistent pitchers in the history of the game, ranking 32nd in BB/9IP, 18th in K/BB ratio while issuing only 445 walks in over 2,450 innings of work. He ranks fourth in franchise Ks (1,467), third in wins (148), second in games started (377), and fourth in innings pitched (2,451). Even though Radke has retired, he is still known to stop by the clubhouse and retain his leadership role. Not as a teammate anymore, but as a mentor and a friend.